Let me tell you: before NeoCon, I clearly didn’t have a clue of half the things the industry had to offer. At the commercial design market in Chicago, brands showcase everything from flooring and furniture to wallpaper and the latest in digital design tech. Plus, it’s a place where you can network, connect and learn about what the industry has to offer. When I heard a professor say that NeoCon is the best market for students to attend, I immediately booked my ticket. And with a Chaise Lounge Podcast press pass, there was nothing to hold me back from diving into what I soon learned is an enormous convention and amazing experience. Anyway, I got there 10 minutes before the 9 am start and man, was it crazy in there! Where do I start? No, really…where do I start? I walked in and people were everywhere. I have to say it was extremely overwhelming at first. There were lines — and I had no idea what they were for — plus doors and stairs leading god knows where. It was like herding cattle, but I guess without the herding part. I have to admit, I found some of the best showrooms from being lost because I would wander until something shiny would catch my eye and of course I would have to go in. And I soon found one of my favorites. Ah, “home” — that’s what Porcelanosa feels like to me. (Click here to read about my trip to the Porcelanosa HQ in Spain!) I happened to stumble across Porcelanosa while trying to figure where I should go, and even though I’m just an interior design student, reps from Porcelanosa and other firms took time to help me learn about their products, how they should be used, and even how they are made. Everyone there thought it was great that I was a student and coming to the market, and they told how important it is to educate yourself on what’s out there. NeoCon had many things to offer students. 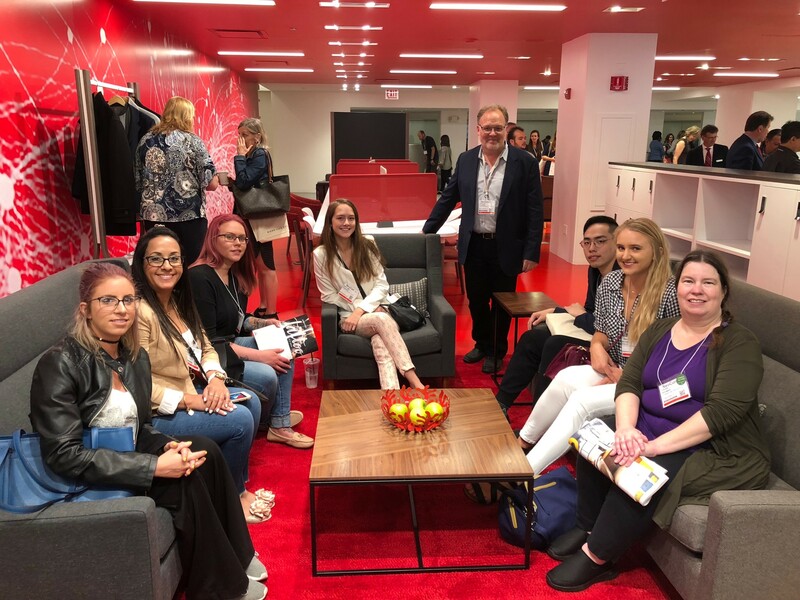 They had a student charrette ( a competition), ASID student tour ( where they take you to explore certain showrooms), a career advice forum, and a career exchange where they critique your portfolio and resume to connect you with job opportunities. All that to offer, but the low number of students taking advantage was shocking! Most of the ones there were either soon to graduate or just graduated and this was the first time they had been. Why aren’t students taking advantage of these markets? Why are they waiting until graduation for the opportunities that our industry provides us with? I cannot express the importance of these experiences. I got to connect with designers, vendors, and students, and there was so much knowledge-sharing. It’s really important to see, in person, what products and brands are shaking up the industry. And, oh yeah, not to mention champagne and snacks! That should be reason enough to force yourself to go – who says no to free champagne? Wear sneakers! Your feet will thank you. Network, network, network. We’re all there to learn about the industry, and that begins with the person in line next to you. Have some sort of plan. I felt like I lost a lot of time trying to figure things out while I was there, instead of planning ahead. Get lost! Pencil in free time to get lost. Sometimes, you’ll find the most interesting or useful showrooms/people when you’re just wandering around. It may be 100 degrees outside but take a jacket. Some of those showrooms were an ice box! Wear comfortable clothes. When I did some research on NeoCon a lot of the advice was dress business, business casual, and dress to impress. The first day I dressed business casual and I think it made it harder for me. Get plenty of sleep! Seriously. Go a day earlier to check out the city- I can’t tell you all that it has to offer! To see more of Porcelanosa’s product line, click here! Trish Semmoum is an interior design student at Georgia Southern University. She will also be YOUR host the forthcoming podcast The Student’s Lounge. It premieres on July 11. Stay tuned! Originally from Morocco, Trish moved to the states mid-way through her youth and has maintained a passion for all things cultural. After completing her Bachelor’s degree in Psychology, she discovered her true passion: design! Trish is currently pursuing her degree in Interior Design at Georgia Southern University, and when she’s not studying or working, Trish likes to travel and try new activities with her son. She’ll be spearheading the upcoming Student Lounge podcast, which will provide resources and wisdom to jump-start the careers of student interior designers. Stay tuned!